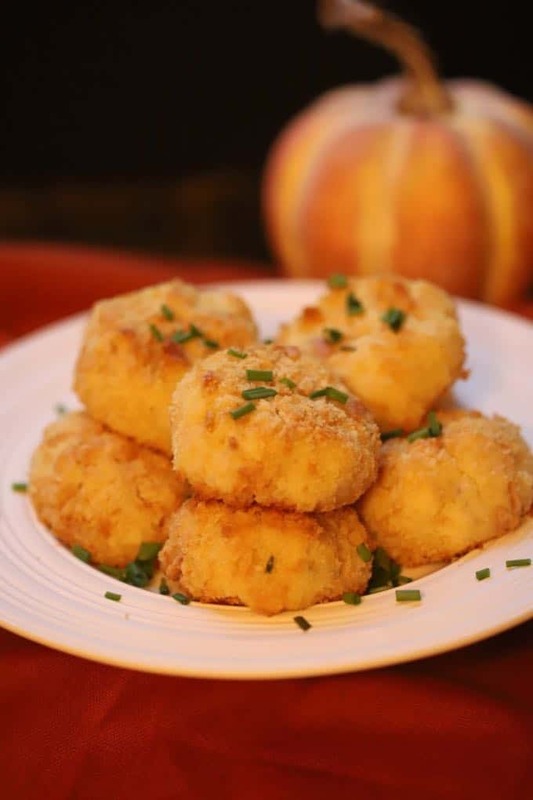 Loaded Crispy Baked Potato Croquettes are a delicious, quick and easy way to use up leftover mashed potatoes after Thanksgiving, or anytime for that matter. Crispy on the outside, smooth and decadent on the inside, these flavorful little gems are full of melty cheese and bacon and are the perfect side dish. And, the best part, no one would ever dream you made them with leftovers. Leftovers are as much a part of Thanksgiving as Thanksgiving dinner itself, and I love the idea of repurposing what’s left over. In fact, I always make more than I think we will eat with the idea of having a few days worth of leftovers. You won’t believe how easy these Loaded Crispy Baked Potato Croquettes are to whip up or how good they are. 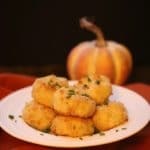 Yes, you could fry instead of baking them, and yes they would be delicious, but you won’t miss the extra calories at all in these baked little potato puffs of heaven! 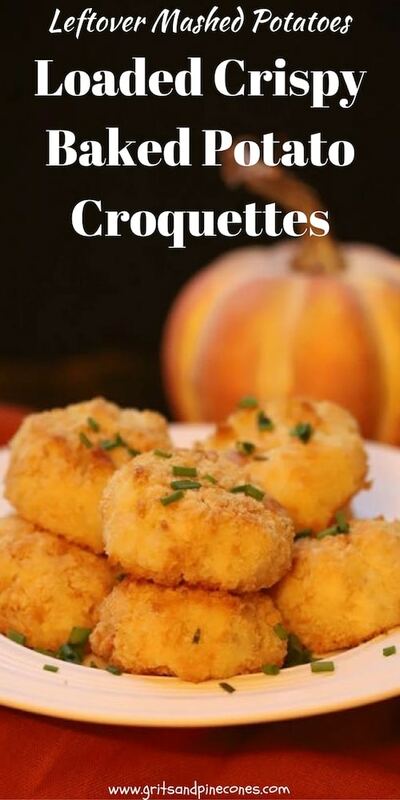 In fact, they are so good you might just decide to make a double batch of mashed potatoes so you will have an excuse to make these tasty, Loaded Crispy Baked Potato Croquettes. 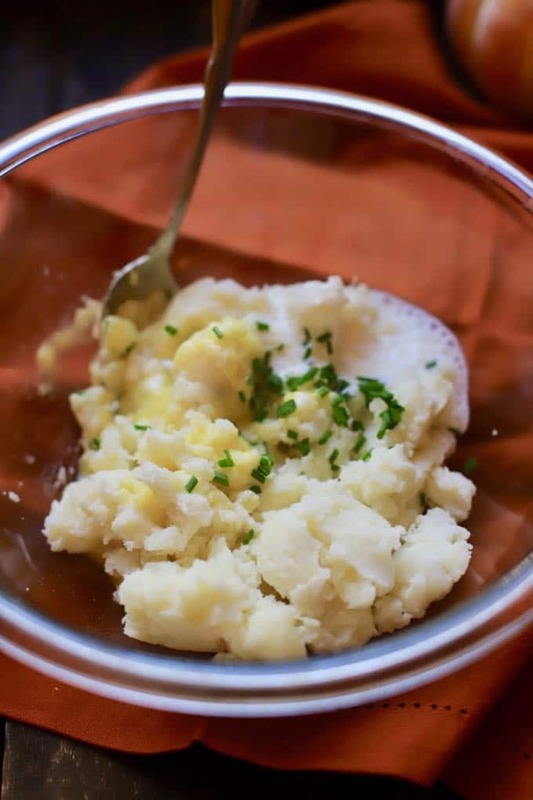 If you have leftover mashed potatoes, my guess is you also probably already have everything else you might need in your pantry and fridge. The other ingredients for Loaded Crispy Baked Potato Croquettes are eggs, buttermilk, chopped fresh chives, grated cheddar cheese, bacon, kosher salt, ground black pepper, crushed Ritz crackers, and butter. Combine the mashed potatoes, eggs, buttermilk, chives, cheese, bacon, salt and pepper and mix thoroughly. Place the cracker crumbs in a shallow dish. Use your hands and gently shape the potatoes into 2-inches round balls, or you could use an ice cream scoop. 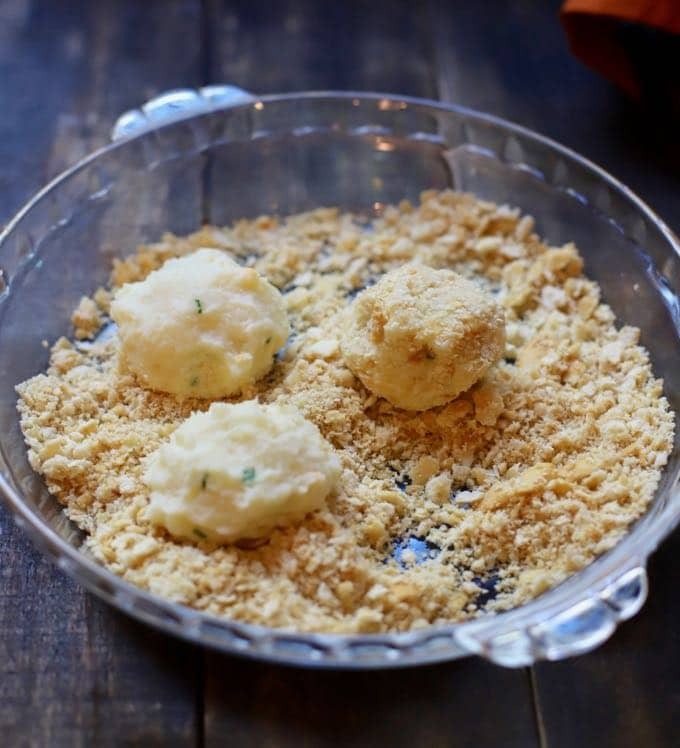 Roll the balls in the cracker crumbs. 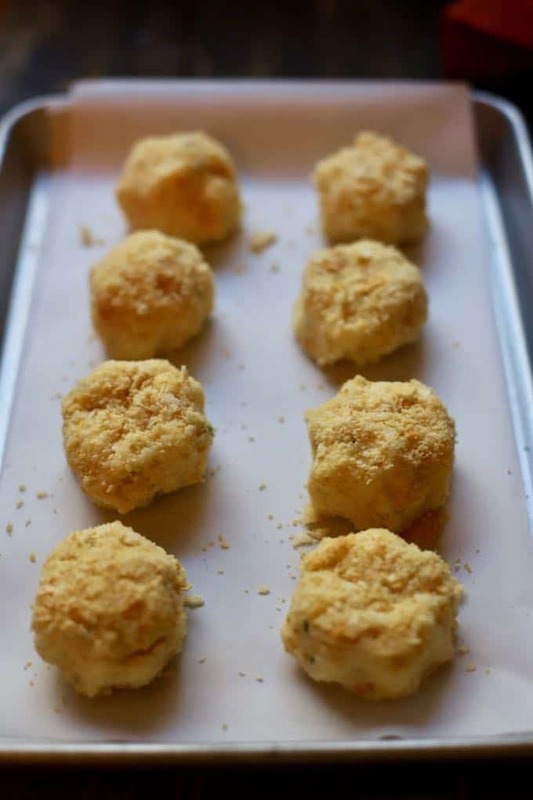 When ready to bake, drizzle the melted butter over the croquettes and bake for 20-25 minutes or until they are golden brown. *Notes: The croquettes may also be frozen until you are ready to bake; allow them to thaw in the refrigerator overnight and bake as directed. 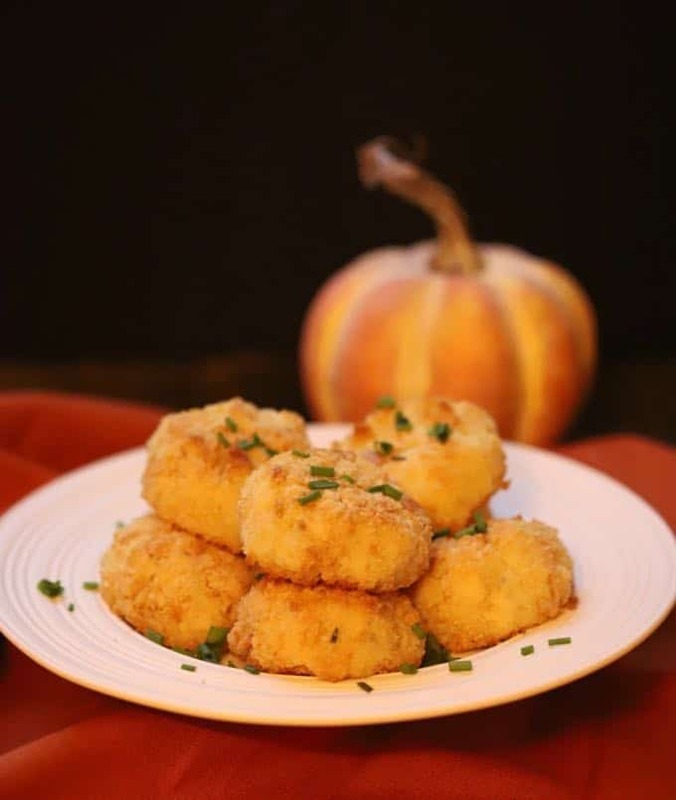 Loaded Crispy Baked Potato Croquettes are full of cheese and bacon and a delicious, quick and easy way to use up leftover mashed potatoes after Thanksgiving. 1/2 cup bacon cooked and crumbled.